Sometimes we who think of ourselves as orthodox Anglicans – whether catholics or evangelicals – feel sorry for ourselves, especially if we are a minority in our diocese. Sometimes we forget how typical it is of God to use minorities in achieving his plan and purpose, or how many examples there are in the Scriptures and in Church history of the FEW keeping the Faith for the MANY. This is when, in one way or another, the institution as a whole “officially” departs from what God has revealed, and God chooses a small minority to work with love and determination to restore right believing and right worship. One such time was the fourth century. Whole provinces of the Church had gone off the rails and were teaching false things about Jesus. In many ways the false teaching then - that Jesus is a created being, “supreme” but not actually God, - is similar to what many so-called “liberal” Christians teach today. And that strikes at the heart of the Gospel and the Faith. Back then it seemed to the orthodox minority that the whole Church was being sucked in by this wrong teaching. What could be done? Well, there were giants among our leaders back then, raised up by God. One of them - a favourite of mine – is St Gregory Nazianzus (329-390). He lived in what is now south-eastern Turkey. Highly educated, he was, according to reports, a quiet, brooding and sensitive man who liked nothing more than to be left alone to pursue the life of prayer. But God had other plans . . . Gregory became a priest and then eventually Bishop of Nazianzus. Four years after his consecration he withdrew to a monastery. In 379 a there was a meeting of 150 orthodox bishops in Antioch. They decided to pull Gregory out of his monastic seclusion and send him as a missionary to the Diocese of Constantinople, which was at that time presided over by one of many bishops promoting the fashionable but false ideas about Jesus. Do you know what Gregory did? He went to Constantinople, obtained a house in which he set up a chapel as an alternative to the “established” church of the day. (He called the chapel “Anastasia”, believing that this was where the Faith would be resurrected.) In this house he baptized, celebrated Mass, preached and nurtured the community in God’s life-giving truth. One of his parishioners there for a couple of years of Scripture study was Jerome. 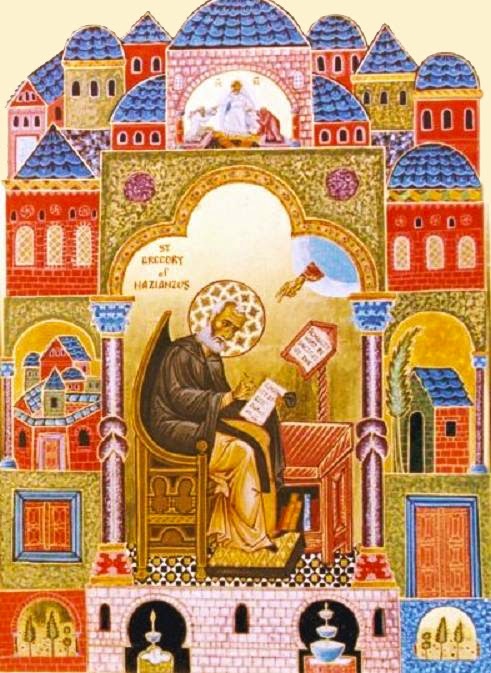 The sermons Gregory preached in his house-church became the basis of the Nicene Creed! History tells us that Gregory and his community helped to turn things around. In fact, Gregory made a massive impact on the Christian world that is arguably still being felt over 1600 years later. It was tough for them; but could they have done it if they had moped around feeling sorry for themselves as we often do? So, whenever we get discouraged (including when General Synod meets!) and the task before us seems too great, we need to remind ourselves of Gregory and others down through the ages who with their little communities were faithful to God and whose labours of love bore fruit - eventually!